Last night Cantabile were guests of the Hereford Rail Mail Voice Choir, https://www.facebook.com/HRMVC, in aid of church funds for St Paul’s Church, Tupsley in Hereford. It was a full house and both choirs sang their ‘sets’ in front of a thrilled audience even prompting the odd gasp and “WOW”. An impromptu joint performance at the end was a fitting finish to the evening and a true crowd pleaser! A warm thank you to the hospitality of St Paul’s and the Hereford Rail Mail Voice Choir and the organisers of the event who worked so hard to create a really enjoyable evening of entertainment. 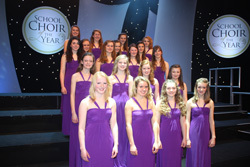 This entry was posted in Concert, Events on February 10, 2013 by cantabilegirlschoir.